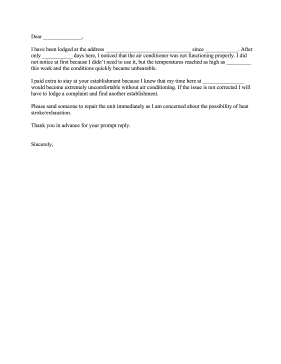 Tenants can use this complaint letter to let a landlord know that the air conditioning in an apartment is not working. I have been lodged at the address _______________________________ since ____________. After only ___________ days here, I noticed that the air conditioner was not functioning properly. I did not notice at first because I didn't need to use it, but the temperatures reached as high as _________ this week and the conditions quickly became unbearable. I paid extra to stay at your establishment because I knew that my time here at _______________ would become extremely uncomfortable without air conditioning. If the issue is not corrected I will have to lodge a complaint and find another establishment. Please send someone to repair the unit immediately as I am concerned about the possibility of heat stroke/exhaustion.